PATH Intl. welcomes Bayer Healthcare Animal Health as its newest Gold Level Sponsor! As part of its sponsorship, Bayer is helping PATH Intl. to "innovate" at this year's conference, which will provide handout flash drives for every participant. Thank you and welcome Bayer! With Mother's Day next week and Father's Day, graduations and weddings right around the corner, May is a great time to help PATH Intl. by shopping online through eScrip. By signing up at www.escrip.com, at no cost to you, you can help fund PATH Intl. with up to 16 percent of your online shopping purchases. If you have any questions about helping PATH Intl. with this program or signing your center up as a charity through eScrip, contact Megan Ream. The Equus Foundation, a Silver-level sponsor of PATH Intl., has opened its 2012 grant application process from now until June 15. Please visit the Equus Foundation website for more information and to apply. Still looking for a great Mother's Day or graduation gift? Consider giving Hope Haven by Victoria E. Mora, a story about the healing power of horses. Each purchase benefits PATH Intl. Sometimes a picture is worth a thousand words. And sometimes a video is worth a thousand pictures. PATH Intl. would like to add some center video links to pathintl.org to highlight the great work our centers do and the lives that can be enriched through equine-assisted activities and therapies. We want to show everyone what wonderful centers we have and give your center some free publicity at the same time. The PATH Intl. website is viewed by tens of thousands of people around the world every month. What better way to show the world what you do? Here are two recent examples posted by centers on the PATH Intl. Facebook page. Send us the url to your youtube videos and we will spotlight them on our website. Send your youtube link to Cher Smith, PATH Intl. webmaster. "I hope that I am not the only person that you hear from who is appalled by the complete disregard for safety in the picture accompanying your article in Spring 2012 Strides on p. 22. This horse has its teeth on this youngster's cheek! As the director of a PAC and experienced therapeutic horsemanship teacher, I work very hard to keep students safe and not put our therapy horses in situations that could have such a poor outcome as this." The discussion opened the dialog between the Strides staff, its technical advisor, some center executive directors and an EFP/EFL professional. PATH Intl. centers do indeed have a wide array of horse and participant interaction policies and best practices. Many centers prohibit hand-feeding of treats, for example, and others actually forbid volunteers and participants from ever touching the face of the program horses outside of bridling and unbridling. Still others allow the participants a kiss on the nose, etc. Some won't allow participants to pick feet and yet others consider that a very important part of their skills teaching. We'd love to hear your feedback, center policies and procedures regarding the type of animal/human interaction represented in this specific instance and other similar interactions. What are your personal feelings? We'll publish responses in a future PATH Intl. eNews and look forward to the discussion! Thank you in advance. Everyone loves a great deal and we have one for you! Specifics and a link to a limited-time offer promotional conference registration fee were announced on Facebook and Community Connections. This limited-time promotion runs through May 15 and spots are limited. 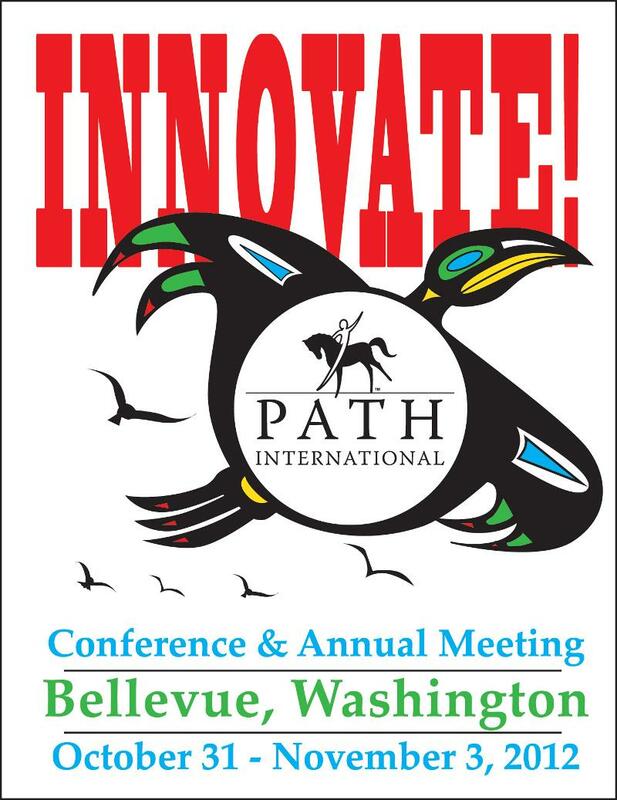 So if you haven't already, "like" us on Facebook and join "PATH Intl. Community Connections" today! There is still time to submit all award nominations for the special individuals and animals at your PATH Intl. center. Nominations are due no later than May 15, 11:59 p.m., MDT. We are in need of more judges. Click here for guidelines and to volunteer. Please send your information by May 10! The PATH Intl. Region 3 Conference was at the end of March in Williamsburg, VA. Kate White, a conference attendee, filled out the survey and then had these words to say: "It really was a superb conference -- in every way! Dreamcatchers in Toano, Virginia, is truly a slice a heaven, and if I could make a TR center to order, it would be just as theirs is now! It was a wonderful educational experience -- the speakers were first-rate, and I came away not only having learned more than I expected, but with more passion than I went with -- and I really didn't think that was possible!" Congratulations, Region 3, on putting together such a memorable conference! Courtney King Dye will speak at a reception on behalf of PATH Intl. Center GallopNYC Therapeutic Horsemanship on May 22 at 6:30 p.m., at Chartis, 180 Maiden Lane in Lower Manhattan. The event is sponsored by Chartis. Courtney is an Olympic-level dressage champion who suffered a brain injury in a fall and is using therapeutic riding to recover. Click here for more information about GallopNYC. Click here for more information about Courtney King Dye. For information about attendance, contact Anne Townsend, (917) 740-4695. The editors of the forthcoming book "Biotherapy - History, Principles and Practice. A Practical Guide to the Diagnosis and Treatment of Disease Using Living Organisms" (which will be published by Springer International) are looking for an experienced academic writer with a background and broad knowledge in the field of equine-assisted therapy to contribute a chapter to the book. For more information, contact editor Martin Grassberger.